A steel vessel closed on both sides by glass plates is half filled with a red liquid. It is screwed horizontally onto vertical steel sections mounted on curved skids. 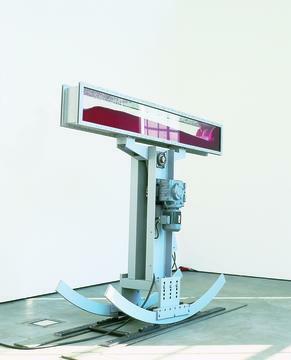 A steel pendulum mounted axially between these sections is made to vibrate by means of an eccentric motor. This vibration is transmitted to the whole of the T-shaped structure. Within the vessel, a surf-like wave-motion surging bakkwards and forwards arises which slowly settles again only after the motor cuts out automatically.